Property 2: Cozy Cottage- Ocean View, beach access with a lookout grass bluff. Property 5: GALIANO GETAWAY- Sunny, gorgeous ocean view, 50 mins. from Vancouver! Property 11: Orchard Cabin - A Cozy Cabin in a Peaceful Orchard Close to Ganges. Property 12: Quaint ocean view cottage in Cowichan Bay village. Property 16: Oceanside Cottage in the Trees - stunningly private, yet so central! Property 24: Eagle's Nest Cottage - Come And Relax On Beautiful Salt Spring Island! 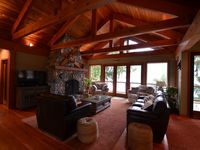 Property 33: Original Shawnigan Lake Cottage with GORGEOUS LAKE VIEWS! Property 41: Spectacular ocean views. Private beach. Abundant Wildlife. Winter stormwatching!